In the early 1990s a new crop of labor leaders ascended to leadership of some of the largest unions in the United States and the AFL-CIO hierarchy. Many of these new leaders were products of the 1960s radicalization, former student radicals who moved to staff positions in trade unions. Coming off the heels of some militant labor struggles, such as the Pittston coal mine strike and the Decatur, Ill., war zone battles, many in the labor movement hoped that a new era of labor militancy was on the horizon. While the AFL-CIO did reverse some formerly reactionary political positions, most notably changing the union federation’s backward position on immigration, no general rise of labor militancy ever emerged. Steve Early’s latest book, “The Civil Wars in U.S. Labor: Birth of a New Workers’ Movement or Death Throes of the Old?” discusses this period of organized labor and the impact the new leaders have had on the labor movement. Early focuses on the second largest union in the United States, the Service Employees International Union (SEIU) and its former president, Andy Stern. No other union reflects the changes made by the new labor leaders more than SEIU and its polarizing leader Stern. Under Stern’s stewardship, SEIU put a massive amount of resources into new member organizing, targeting public sector, building services, and health-care workers. But despite the resources invested, SEIU leaders became frustrated with a series of organizing losses. The rigged NLRB election process made success rates in new worker organizing low, as employers took advantage of weak NLRB enforcement by intimidating workers through illegal terminations of union supporters and other strong-arm tactics. Early describes how Stern concluded that the only way to realize SEIU’s goals for achieving union density was through circumventing NLRB elections by convincing employers into card check agreements. These agreements came at a price, as SEIU had to agree to limited contracts that often barely increased wages and working conditions. This led to conflicts with other unions organizing workers in the same sectors, most notably the California Nurses Association, who often challenged SEIU’s efforts to organize nurses under neutrality agreements that involved inferior contracts. Countless millions have been spent by SEIU and other unions in fighting each other over the past decade. Early shows how this culminated in a major internal labor battle within SEIU. When leaders of the California health-care local United Healthcare West (UHW) opposed concessions negotiated with hospitals by the international, the local was placed in trusteeship. The expelled leadership went on to form a new union, the National Union of Health Care Workers (NUHW), which challenged SEIU at the union’s major bargaining units in California. Early provides extensive detail of the players and issues involved in all of these inter-union conflicts. The corruption and despicable actions of SEIU leaders and their armies of staffers are exposed. The real value of the book, however, is not the detailed explanations of the civil wars of labor, important as that information is. The real value lies in Steve Early’s explanation of competing visions of what labor union are supposed to be. Early shows how Stern, and other labor leaders as well, have sought to transform unions into staff driven, top-down, undemocratic institutions that in their extreme versions are little more than issue-advocacy and lobbying organizations. In contrast, relying on his 27 years of experience as an international representative in the Communication Workers of America, Early explains the importance of having rank-and-file involvement in union activity. The most vivid account of this is Early’s description of the ultimately unsuccessful attempt of SEIU to replace shop-floor representation with 1-800 call centers. Stern wanted to move union staffers from representing workers on the shop floor to political organizing, largely working to elect and lobby politicians. To replace them Stern developed national call centers to which workers could phone in grievances. Millions of dollars later, SEIU was forced to junk the call centers after complaints from members and local officers that they were completely useless for solving members’ issues. “Civil Wars” provides a detailed account of the internal conflicts of the labor bureaucrats during the 2000s, and shows why despite massive resources spent by major unions, labor continues to lose members and fails to organize new ones. Steve Early also provides a different vision of how unions should be run—with rank-and-file participation and democracy. Trade-union activists, and anyone else interested in building a workers’ movement, would be well served by reading this book. 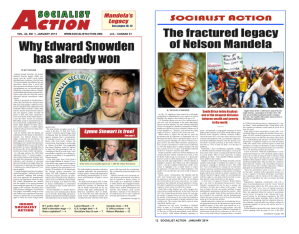 > The article above was written by David Bernt, and first appeared in the November 2011 print edition of Socialist Action newspaper. November 20, 2011 in Labor, Uncategorized.